"A cookie jar in every room"
Check-in is between 3 pm and 8pm, unless other arrangements are made at the time of reservation. Check-out is before 11am, unless other arrangements are made at the time of reservation. # 1 THE BENTONSPORT ROOM was the Inn’s pub--for men only. No curtains were allowed on the windows, so women could peek in to see if their men were inside drinking. 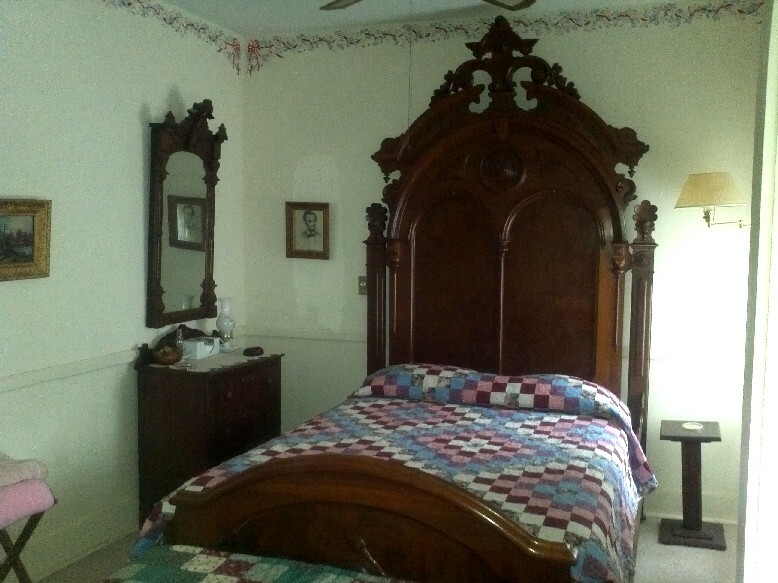 This room’s dresser and headboard are solid hand carved walnut. The 1882 “Cheerful” stove has a foot warmer. 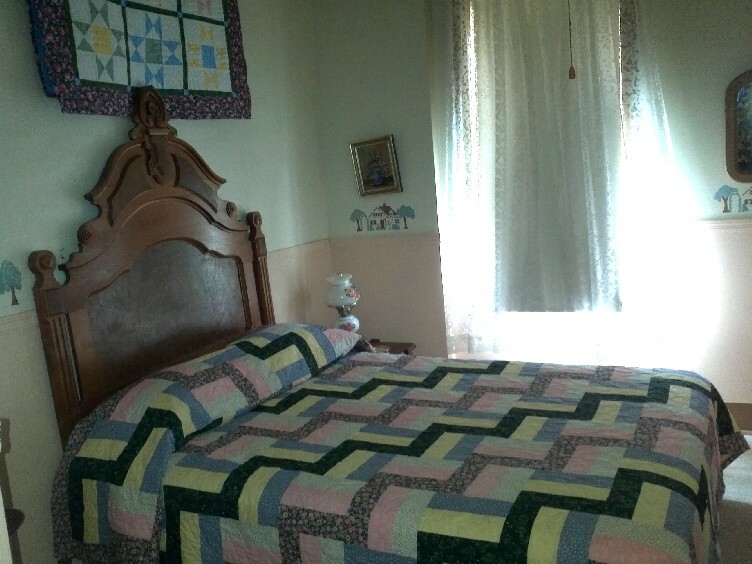 Watch the river go by, or activity in the village from your rocking chairs. This mattress is a Tempur-Pedic Ergo bed. Enjoy the comfort of the Tempur-Pedic mattress and pillows. 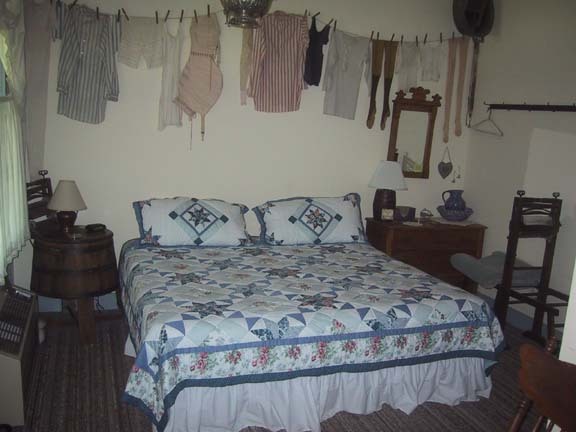 # 2 THE WASH HOUSE ROOM has your grandmother’s vintage clothes hung up to dry. An early wooden washing machine is your bedside table. Park your bags on the old wringer/tub stand. Private entrance from the porch (with swing) overlooking the river. For our business travelers, this room features a desk and chair for your use. Return to the Main house for breakfast in the morning. # 3 THE GENERAL STORE ROOM is stocked with all the tins of staples you need to set up housekeeping in 1850. There is also a fresh produce and dry goods department. This building used to be Bonaparte's train station. 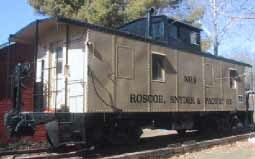 In 1960s it was dismantled and brought to Bentonsport and used as a little store. The items in this room are what is left of the store. Private entrance from the porch (with swing) overlooking the river. Return to the Main house in the morning for breakfast. 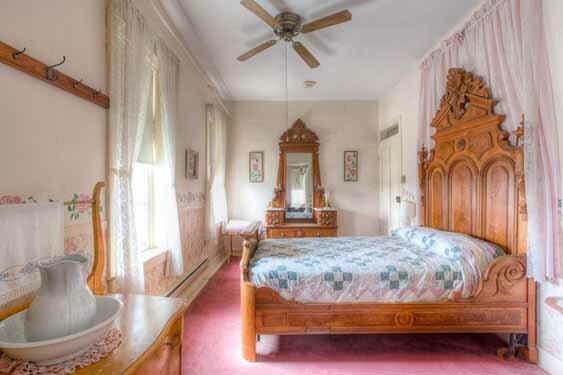 # 7 THE WILD ROSE ROOM is named for our state flower. 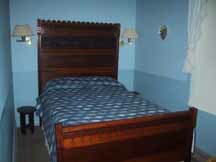 The hand carved dark walnut bed has a nine-foot headboard--copied circa 1870 from a guest bed in the Lincoln White House. 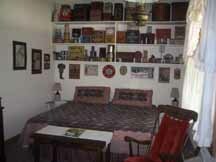 The room is decorated with Lincoln books and memorabilia. 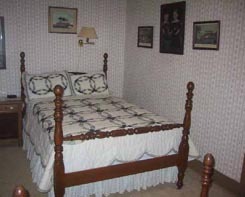 All rooms have private bathroom with shower, individual heat and A/C. Rates are for single & double occupancy. Add $10 for each additional person, per night. A deposit of one night’s room rate is required to secure a reservation. Full refund upon 7 days notice (14 days notice required on special weekend events), or if we are able to re-rent the room. If you are a "no show", your card will be charged for the full amount of one night's stay. If you cancel on the day of your reservation, you will be charged a $25 cancellation fee. Reservations must be secured by Visa, Discover, or MasterCard, or you can mail us a check for the total amount. Payment with check or cash is preferred upon checking in, but we also take Visa, MasterCard, and Discover credit and debit cards. Check-in between 3 p.m. and 8 p.m. Check-out before 11 a.m. If other hours are needed, please inform the Innkeepers as you make your reservation. If you are going to arrive before 3 p.m. or after 8 p.m., please inform the Innkeepers at the time you make your reservation. We do not have a liquor license. If you want to bring your own alcoholic beverage, please limit it to the equivalent of one bottle of wine. All consumers must be over 21. A Quite Time noise restriction is in place from 10 p.m. to 6 a.m. This includes adults, children, and DVD players. Well behaved children are welcome, if they are comfortable around antique furnishings, and if their parents are comfortable with them around antiques. Anything broken will be charged to you. No pets please. We do have cats on the premises. We will be glad to furnish your group a special rate of 5% off, when four or more rooms are reserved and when payment is made with check or cash. 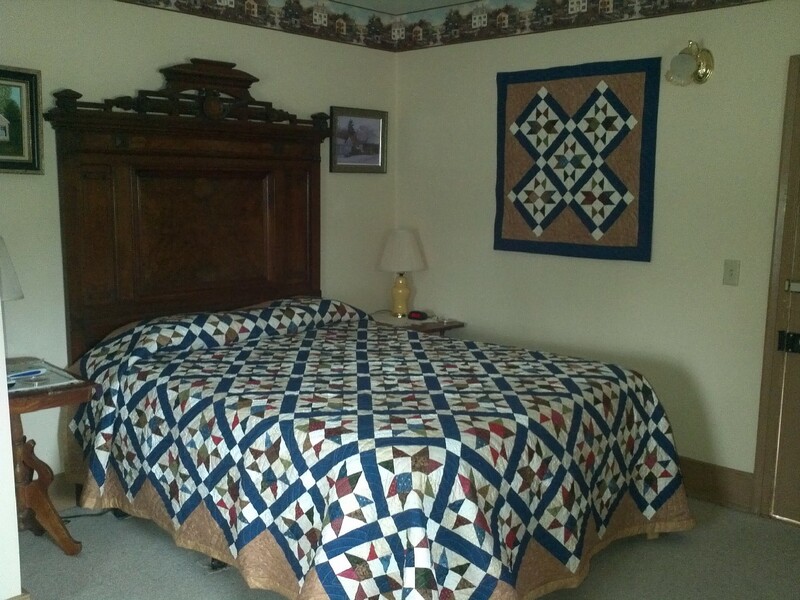 The group rate is also available if one room is rented for 4 or more nights in a row. No discounts with credit cards. Since this is our home, and you are a guest in our home, we reserve the right to not accept guests at our discretion. We reserve the right to call the sheriff to remove any unpleasant guests.